Photoxor C1 is a photography tool for exposure and depth of field calculations. Use the device camera based lightmeter to estimate an Exposure Value (EV) reading, determine camera settings and calculate adjustments needed for a (neutral density) filter. The Depth of Field calculation shows the near and far limits of sharpness, and additionally provides a graphical visualisation of the level of sharpness and diffraction. The Circle of Confusion (CoC) is automatically calculated from the camera sensor size, but may be overridden with a custom value. The Depth of Field calculation also allows specifying the range of sharpness (near and far limits) and calculates the needed camera settings. Advertisement free: Get more screen space by removing the advertisement banner. High Precision: An essential feature for the serious photographer!Get your calculation outputs (depth of field, field of view) in high precision - configure between 2 and 8 significant digits results. 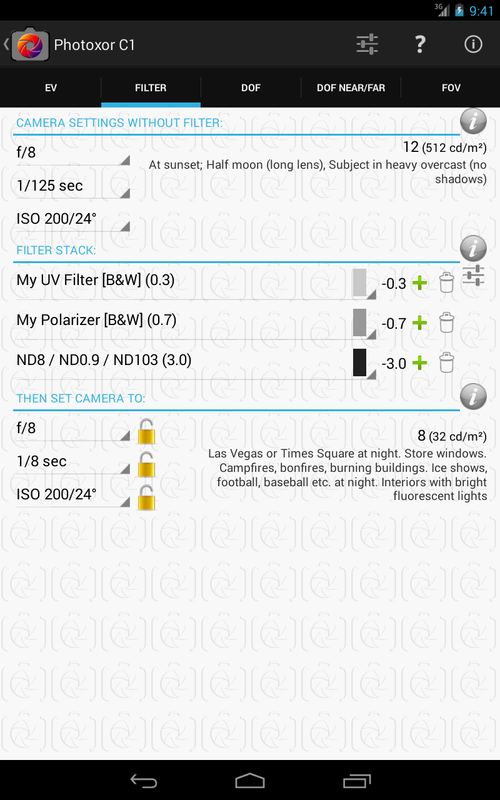 Filter Stack: Define multiple stacked (neutral density) filters and calculate the resulting effect.